The permanent fabricated sheds are erected using graded material that ensure utmost reliability and solidity to the sheds. These sheds serves as the best possible way to utilize the available space for storing or saving the material against rain and sun. These sheds can be erected at large construction sites for storing bulk material and also as community parking. Incepted in the year 2006, S.M. 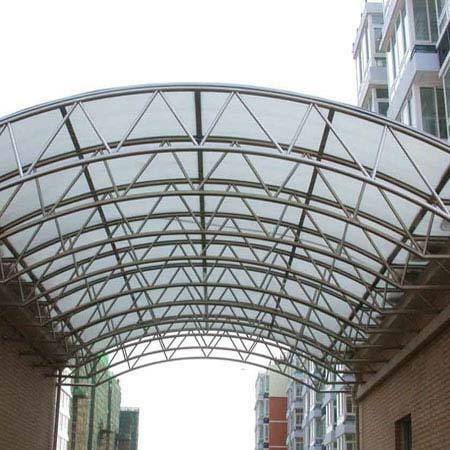 Enterprise is a sole proprietor firm headed by Mr Mohammed Modi and is engaged in manufacturing and trading an extensive variety of- Construction Nets, Safety Nets, Packaging Nets, Anti Bird nets, Bird Spikes, Tapaulins, HDPE Waterproof fabrics and Shade Nets. We are authorized dealers and stockiest of Garware Safety nets and Bird nets, Garware is pioneer in the manufacturing of world class ropes and nets for the safety industry, fishing industry and sports industry, it exports in more than 80 countries and is the best in India. We have our Super Star brand of waterproof fabrics which is virgin and UV Stabilized for maximum life. Our 125 GSM is stronger than 250 GSM of any local brand. We also build a range of challenging monsoon sheds for rain protection. We undertake installation services of anti-bird nets, Anti Bird spikes and safety nets at industrial and domestic sites. We produce metal, acrylic and other plastic items according to the client’s requirements using plastic injection or blow molding processes, concerning to the display industry. Our manufacturing unit is empowered with sophisticated technology and machines that facilitate us to fabricate our series of products as per the international standards. The commitment, efficiency and in-depth knowledge of our experts have helped us in offering our collection as per the precise requirements detailed by our clients. We productively cater to many reputed FMCG, pharmaceutical, automotive, retail, bottling & construction industries across the country. To meet the bulk requirements of clients we also guarantee that we keep utmost stock of all usually demanded products. We make sure that our manufacturing methods as well as our products are environmental friendly. Our professionals are capable and have in-depth knowledge in the sphere that facilitates us to complete all the business processes smoothly and sustain amiable relation with clients as well as with our vendors.